Domo arigato, Instructables Roboto. Announce to visitors that you run a reputable establishment...wait, at least one that has beer. Noren are traditional Japanese banners/curtains hung up in doorways or entrances. They are utilitarian by providing some privacy and may block odors traveling to the next room. Noren are decorated by traditional methods. I am making this with modern convenience of fabric markers but please feel free to recreate this with the many other wonderful ink, dye, woodblock, print and textile techniques used for generations. This is a great project to improve the shabby chic of your dorm room or separate the space from your evil roommate. Bricobart, a rare manly beer. For men, it puts hair on your chest - for women, it puts more hair on your chest. CAUTION: Drink. Make. Drink some more. Make responsibly. You need some thin material to make your banner. You can upcycle material salvaged from an old bedsheet or even take apart a worn pillowcase. The fabric panels should be somewhat rectangular in shape. Plan on enough material to cover the doorway or opening widthwise and maybe hang down about 1/3rd to half the height of the door. Noren or the Japanese curtain will have a slit to facilitate the entry and egress in and out of the covered space. I "borrowed" the brat's special permanent ink markers for fabric. Like any ink marker, the ink will get used up quickly if you have a large area to cover. Start saving up for a set of Copic refillable markers and figure out if you want to spend it on that or the kid's college education. Wow, they even have a blending fluid marker. You need to sew a bit. Or get that iron-on fusible tape to bind the edges and attach the curtain rod tabs. Learning to sew by hand is a great skill to have. My sewing was all done with a serger. I have found it to be a useful tool for making stuff. CAUTION: Be careful with sharp cutting implements, pointy sewing needles, and convenience machines of the industrial age. 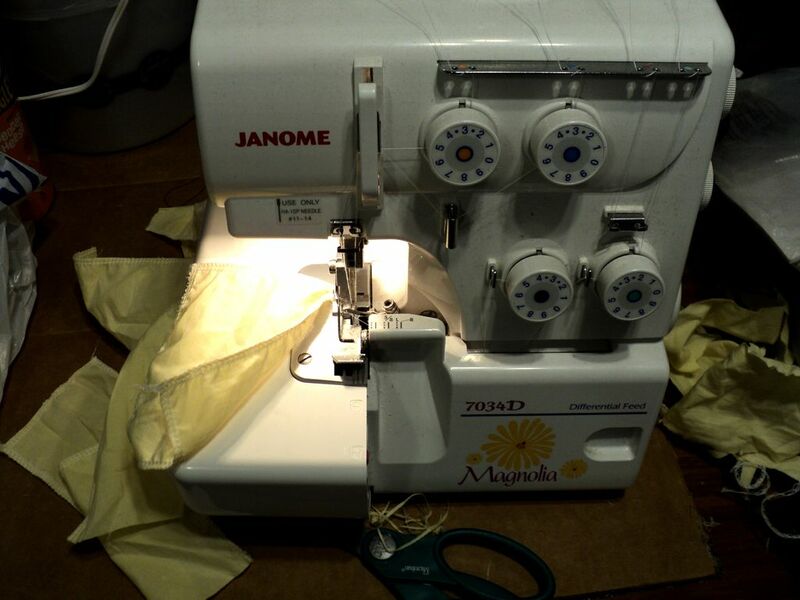 I used the serger to bind all around the edges of my two fabric panels. They were 19" x 32" each. I then joined them in the middle connecting about 1/3rd of the way down with a seam. I had some excess fabric that was trimmed from the panels so I made hanging tabs for the curtain rod. The tabbed design instead of a plain rod pocket top edge is typical of East Japan noren. If done correctly, it will look like a pair of boxer shorts hanging out to dry. I guess some drawing skill is needed in this step but you can accomplish the same by using previous artwork and tracing or projecting the image on the fabric. Use pencil to sketch and outline your design. You can wash out the pencil marks later if needed. I tried to copy the Japanese katakana characters for beer, so I tried to mimic the calligraphy without a traditional ink brush. Lay out on a big sheet of cardboard so that the ink bleeding through the fabric will not ruin anything below. Use a permanent marker to ink in or sketch your lines in your robot drawing. Stretch and hold the fabric taut with your fingers so you can write smoothly with the marker. Select the areas that you will block fill with colors. Use the appropriate marker and color in. Don't saturate too much with ink or it will bleed or spread outside of your lines. Color in one area and work on the next or different area. Let the marker rest every once in a while so the ink can flow to the tip. I think a nice watercolor or ink wash might have looked more traditional. Find a place to hang up your noren. Enjoy the new ambiance provided by the noren. Sushi may or may not be a good choice to quell the munchies. I just came back from the Bask mountains and this is one of the best back-home-news I had in years, I have my own beer!!! Ubercool, thanx a lot my friend! The answer to life's questions is not found in 42 beers, it's just 42, something like that. I don't think Bricobart beers are for export. You have to make your own. बहुत बढ़िया. हम माउस पर राइट क्लिक का उपयोग और अनुवाद का चयन करके बहुत ही सरलता से चुने गए किसी भी भाषाओं में संवाद कर सकते हैं. क्या मजा. The robot looks great and wove your instructions in with some awesome information! Thanks for sharing! Ibles are more fun when you pick up some trivia knowledge out of it.